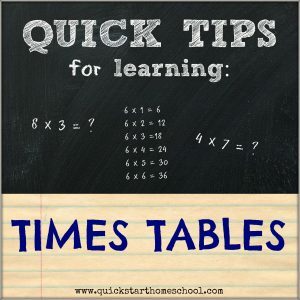 Struggling with times tables? These tools can help. 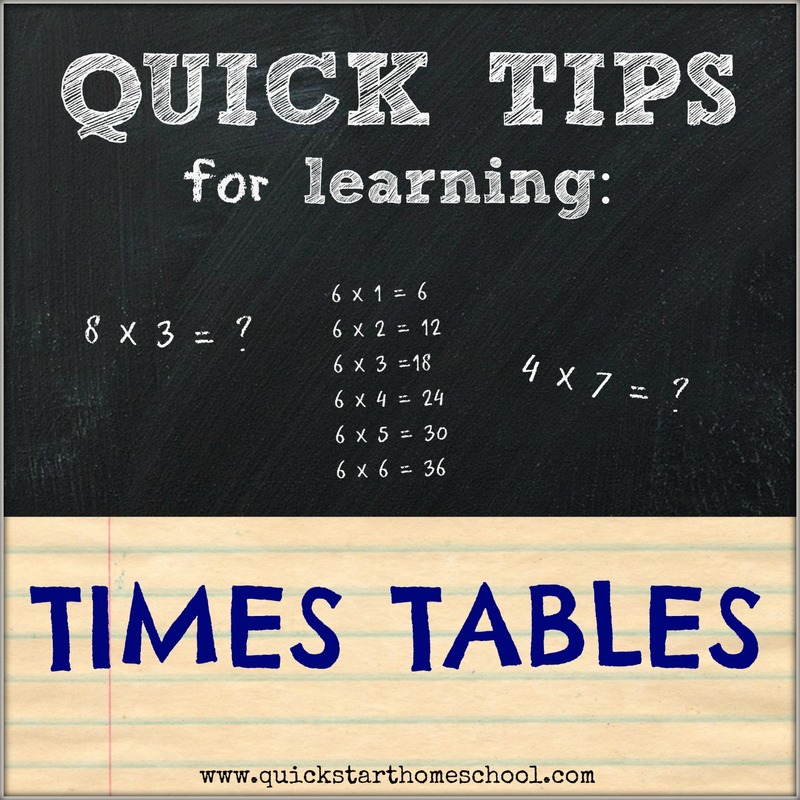 Students of all ages sometimes need help learning “times tables” or other math facts. While this can be inconvenient, it’s not at all uncommon, so I urge parents not to worry. When math facts seem to be taking a while, it’s a good idea to step back and try other ways to approach it before moving on. Since all children are unique, finding the right system could take a couple of tries…but the facts will come (take heart, eventually…) either thru learning, rote memorization, some other way that makes sense to the student, or all of the above. For math facts, there’s almost always a method, tool, or product that resonates with each unique student. For us, homemade games, visuals, rhymes, and all kinds of silliness worked well, too! If you’ve had success with a method not listed here, please leave a COMMENT so my readers can give it a try. A major concern for many home educating parents is how to teach math. Some parents worry they’ve forgotten so much math, they won’t know how to teach it. Others worry about the significance of math, not just as an academic subject, but because of its impact on the bigger picture (i.e., higher level courses like Chemistry; getting accepted to college; success in a career; adult life). The thought of failing the child, or not knowing how to help a child who struggles with math, can be overwhelming. Personally, I find many parents worry about math unnecessarily. 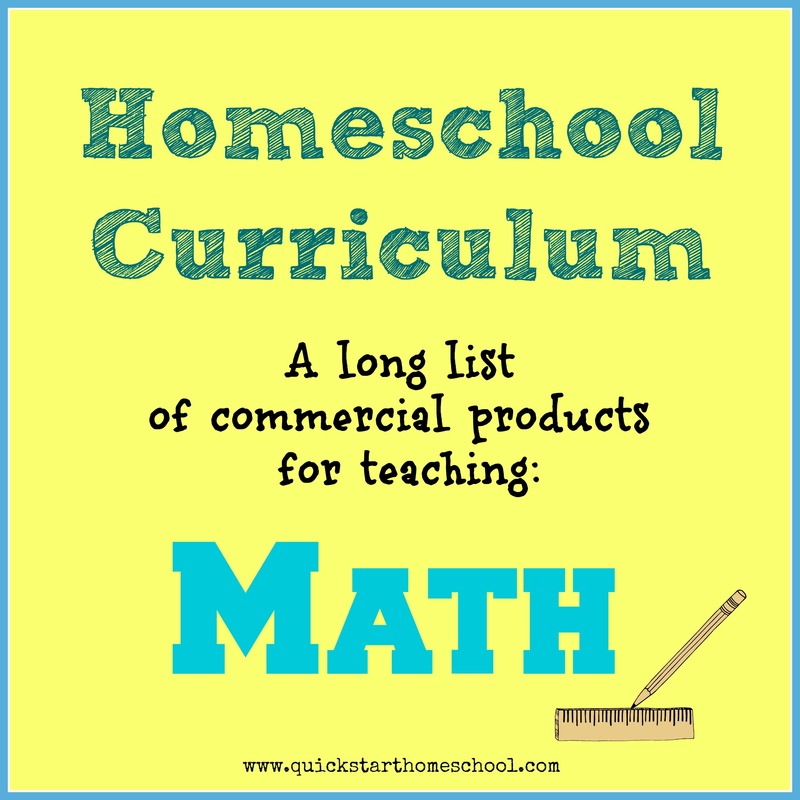 First, there are thousands (literally) of products on the market to help teach math at home…no experience required. Next, I believe most children have a greater ability and a higher aptitude for mathematics than given credit for. I believe math-phobia is wholly fabricated, created over the last 50 years or so. A culture filled with math jokes, stories and other horrors only fuels the belief that math is harder than other subjects. Perception, in my opinion, has contributed unfairly to producing a generation of math-phobics. Certainly some students are better in math than others, just as some are better writers, better athletes, and better musicians. But, nobody is incapable of learning math to some respectable or practical degree. I’m going to explain 3 different ways to attack math instruction in your homeschool. These are 3 common ways, ways you can adopt into your home education program right now. They’re not unusual, they’re not very hard to figure out, and thousands of people are using them as I write this, so you’ll find lots of support for your chosen method if you begin looking for it. 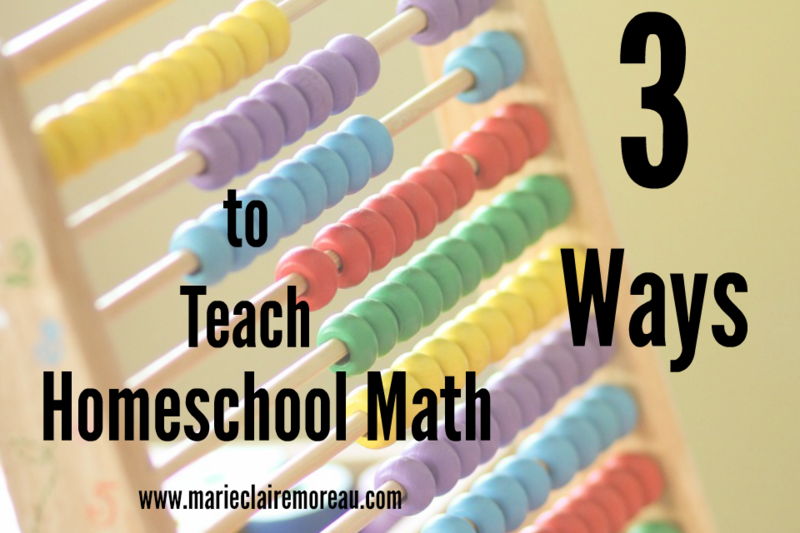 Three ways to teach homeschool math. Easy, explained. I recommend reading through the methods, below, then selecting the one that makes the most sense for your child at this time. Then, as you get to know your child a little more, switch things around if you notice the approach isn’t going to work for the long term. You can also change things around anyway, to add variety and fun to the curriculum. And, by all means, feel free to use different approaches for different children in the family, too. Convenience and saving money notwithstanding, choosing different approaches for different children is really the best way to reach their uniqueness. Perhaps the easiest overall, following a pre-packaged math curriculum is a convenient way to cover an entire year of math using a single product. Following the daily lessons and using the instructions in the guide book tends to insure a variety of topics will be covered in a given year, and that topics will be reinforced until the student gains full mastery. Many people like this approach because they’re not always sure what to teach in every grade, so they feel better knowing someone else has already figured it out. In a 3rd grade math curriculum, for example, parents gain peace of mind, knowing the book will cover all of the usual 3rd grade math concepts, like place value, Roman numerals, carrying, borrowing, money, averaging, and so on. Products like these are organized, convenient, and generally easy to follow, no matter the math level of the parent himself/herself. Packaged curriculum products aren’t perfect, though, and can hold students in a cycle of repeating the same (or similar) material over and over again, even though they’re ready to move on. Knowing when the student is ready to progress to the next level is crucial to successful boxed curriculum use, and using the provided tips and assessments is essential to figuring that out. Examples of boxed math curriculum products include Saxon Math, Horizons Math, Singapore Math, and Math U See, but there are many more to choose from, too (here’s a big list). Another way to teach math at home is to cover specific topics, each one at a time. This method requires zeroing in on a specific concept to teach, then finding a resource(s) for the student to learn it. Concepts might include counting money, learning times tables, adding decimals, performing long division with remainders, or anything else parents decide to teach. To teach fractions, for example, parents could use a book specifically about fractions, some video lessons about fractions, some exercises printed from a web site, or a live class where someone is teaching the students about fractions. They might create lessons on their own, using materials they already have around the house, or even small toys or objects to illustrate the ideas. Targeted lessons like these will continue until the topic has been thoroughly explored and the student is showing true mastery, so it is not unusual for different students to take a different amount of time to learn each new concept. Disadvantages to teaching this way is when parents don’t know what concepts to teach, and in what order, or may introduce concepts before the student is actually ready. Some parents lack the confidence to teach in this way, or to properly identify when the student shows enough progress to move on. Examples of targeted math resources, in book form, include The Key To, Kumon, and Spectrum, but there are many other education products available in book stores, retail stores, and online which support this method of instruction. One tool I particularly love is Math Wrap-Ups (find them here). Homeschool parents tend to overflow in the areas of creativity and resourcefulness. It doesn’t take long before homeschoolers discover tons of neat, inexpensive ways to learn without really even trying. 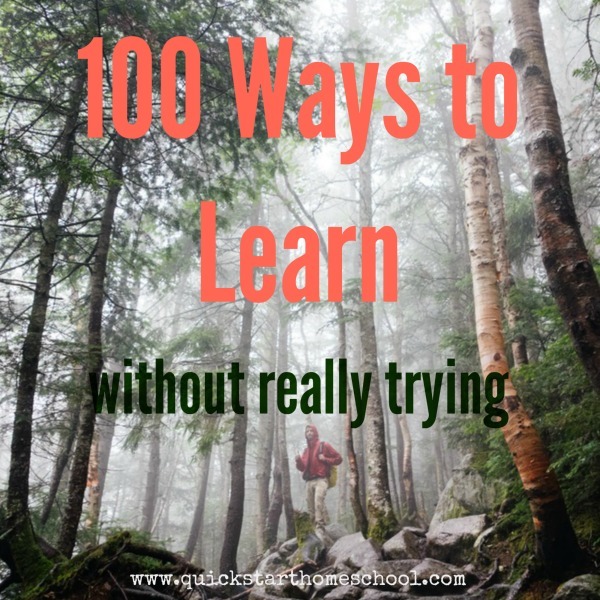 Should your family be running short on ideas, however, may I present my list of “100 Ways to Learn (without really trying)”? Hopefully, you’ll find something here you’ve never done before, or something that may set you on a path of learning something new! And did I mention most are FREE? Take a virtual field trip: Travel to The White House, The Smithsonian Museum of Natural History, the ruins of Pompeii, a car factory , or anywhere else you like. Visit a pool store: Learn about pH, chlorine, acid, algae and watch real chemistry in action as store employees test pool water samples. Attend a yard sale (swap meet, flea market): Hunt for bargains or just compare prices while having a fun day wandering the aisles. Better yet, give the kids a couple of dollars, then compare who makes the best purchase by the end of the day. Return bottles and cans: Kids learn great lessons in recycling, cleaning up the environment, and about calculating their earnings with this free and worthwhile activity. Buy a snack from a vending machine: Necessary life skills come from buying chips and sodas from these machines, including inserting [crisp, unfolded) bills and getting change, comparing prices, selecting items according to a grid (letters, numbers), security issues around using credit/debit, nutritional content and more. Visit an auto care center: Car repairs offer all kinds of learning. If your local automotive center has a free self-diagnosis area, this is a great way to learn about battery life, tire pressure, brake safety and more. Head to the community center (church, hall, senior center) for BINGO night: Playing Bingo is one of the fastest ways for kids to learn letters, numbers, matching and good sportsmanship. It’s fun, too! Head to the food court: Food courts are famous for offering a variety of ethnic dishes (and free samples, too). You can buy lunch, or just enjoy traveling the world while checking out all of the different dishes from all around the world (China, Japan, Mexico, Italy, and more). Shop a discount center: Discount food centers, discount jewelry outlets, and discount furniture outlets are great places to compare prices over full retail. Find new places to shop, and spot great bargains this way, too! Visit a science center: One of the bests places to get hands-on science training is by visiting a science center, a children’s science museum, or a theme park with a science or engineering theme. A full year of experiments can be had for the price of just one ticket. Be sure to ask about homeschooler, teacher or student pricing before you go. Use your bank’s drive-thru or deposit box system: This teaches kids about saving, while also learning about using drive-thru monitors and other gadgetry, accessing personal accounts “long-distance”, and the protocols and manners required to use systems like these. Treat yourselves to a BOGO deal: Whether at the grocery store, coffee shop or department store, BOGO deals have much to teach children about shopping wisely, saving and spending. Visit a construction site: Carefully observe (from a safe distance) the machinery, employees and activities at a local construction site. If permitted, check out the plans or other public documents to find out what is going on. Vote: Watching a parent vote in person or completing an absentee ballot is a great way for children to learn about the legislative system. Cover voter eligibility, parties, candidates, platforms, precincts, and more. Select an insurance policy (life, home, medical, flood, car, etc.) By helping their parents with this activity, kids can learn about comparing prices and benefits, plus gain valuable life skills having to do with the necessity of purchasing these plans (or the consequences of not having them). Attend a town meeting: Any town meeting will do, whether a school board, emergency preparedness, energy conservation committee, budget meeting, or anything suitable for the ages of your children. Shop online: Making a purchase online requires comparing prices, figuring shipping, entering a form of payment, and anticipating a delivery. All great life skills, rolled into one easy transaction. Help a neighbor: Whether walking a dog, weeding a garden, or just bringing in a newspaper or mail, kids learn kindness and compassion by helping others. Clip coupons: Browsing mailers or newspaper inserts is a great way for kids to learn about shopping and saving. This is a fun activity that has the potential to branch in many different directions (donating to a food pantry, saving enough cash to afford an ice cream treat, tracking the grocery budget, and more). Mending, lengthening or shortening clothing: Repairing and tailoring clothing an excellent way to talk with children about extending the life of the clothes they wear. Here’s a real skill that lasts a lifetime. Tenderizing or marinating meat: Inexpensive cuts of meat can be easily transformed using a little kitchen magic. Be sure to talk about the physical and/or chemical transformations that take place in the process. Create your own: Spice blends, soap bars, cleaning products and more. Lots of extensions for learning beyond the recipes themselves. Take, edit and store photos: Think composition and lighting, special effects, uploading to photo sites, or creating collages. Making prints, videos or sharing photos keeps the learning going even longer. Minimal cost for valuable skills plus a whole lot of fun. Write notes, cards and letters: Handwritten sentiments are special to create and even more special to receive. Consider writing to loved ones, military personnel, fan clubs, pen pals, or even The White House. Penmanship and letter writing skills are more and more rare. Encourage your children to understand the value of the hand-written word. Organize something: A closet, a drawer, the pantry or a toy box. Skills like these don’t always come naturally. Kids might need to be taught this skill, so they can benefit by being orderly and organized the rest of their lives. Plan something: A vacation, an event or an outing. Depending on the activity, learning here may come in the form of scheduling, map skills, budgeting, creating invitations, buying tickets, and lots more. Make (or participate in) a Scavenger Hunt: Creating a Scavenger Hunt is great fun that comes with hidden learning as kids identify objects, create scenarios, label items or establish a scoring system. Participating in a Hunt is equally fun, and comes with the possibility of object identification, physical exercise, beating a timer, healthy competition and more. Visit a farmer’s market: Learning about new foods, local farms, and so much more by browsing fresh produce selections at the farmer’s market. Be sure to check out all the offerings, including honey, raw dairy, fresh eggs, to maximize learning too. Go to work: Many moms, dads and grandparents are given the option to take a child to work every now and then. Seeing what goes on at the office, factory, retail store, or small business is experience kids can’t get anywhere else. Reorganize a room: Measuring a space and mapping out furnishings is really fun to do by hand or using a computer. 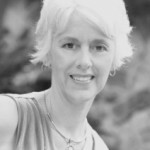 Discussions can also include efficient use of space, comfortable flow and principles of Feng Shui. Read the FAQ section: Of a favorite place, product, service or business. Kids love learning more about their favorite toys, activities, celebrities and more. Reading FAQs can result in new learning and a greater understanding of whatever-it-is. Visit a bookstore: I can’t think of a better way to spend an afternoon. Spending is optional. Take a nature walk: Observing nature has a way of bringing all kinds of curiosity and questions to light. Dream. Discuss. Hypothesize. Sketch. Photograph. Collect (shells, pebbles, pine cones). Look up the answers later on. Or not. Watch the day/night sky: There is no better way to consider concepts like day and night, the Earth’s rotation, the changing of the seasons, and the vastness of the universe than by looking up. Make a telephone call: Phoning a close friend or relative is a great way to teach children how to dial a telephone, engage in polite conversation and close out a call with good manners. Etiquette practice: Kids learn etiquette and manners by doing. Setting a dinner table, escorting someone to an event, eating in a restaurant, and other situations like these often require slightly different behaviors than children might practice at home. Take messages: Whether taking phone messages or leaving notes for mom and dad, this important skill is sometimes overlooked when training children in modern society. Proper message-taking is key for life and business later on. Teaching this early provides a great headstart. Maintain something: Whether a bicycle or scooter, a guitar or a trombone, a set of tires or a refrigerator, keeping things in working order teaches valuable skills, plus extends the life of these expensive items too. Wrap a gift: Gift wrapping and other paper folding activities are great for motor coordination and visualizing geometric and spatial relationships between objects. Kids enjoy giving, too, and this holds valuable lessons all its own. Mail a package: Nothing illustrates the postal system more than experiencing it first-hand. Carefully packaging an item, weighing it, buying postage, and tracking it to its destination is fun and comes with great extensions into geography, measurement, and more. Re-cover/reupholster something: Choosing foam and fabrics to recover a chair, stool, arm chair or felt board can be great fun. Doing the measuring, stapling, gluing and other needed steps to complete the project teaches recycling/upcycling, saving money, using tools, measurement, motor coordination and more. Follow a recipe: This activity utilizes more than cooking skills, as it may also extend into measurement, chemistry, precision, world cultures and more. Raise something: A chick, rabbit, puppy or tadpole. This is hands-on investigation at its best. Plant something: Planting from seed or seedling, and watching something grow is both satisfying and productive. Hang a picture: This activity extends into planning, measuring and using simple tools. Stuff something: Remember the last time you stuffed a pillow or plush toy? You’ll probably recall that this is an activity that takes quite a bit of practice to get it right. Kids can benefit from from this exercise in coordination, patience and planning, too. Clean something: Life skills should be taught early, and reinforced throughout childhood. Kids as young as 2 can begin dusting and wiping counters. Older children may gradually progress into more difficult jobs, giving them an advantage when they become adults. Make candy: With supervision, using a candy thermometer and watching candy form is both a revelation and a great learning opportunity. Eating the results is a great reward! Trim back a tree: Watching sap flow, observing wounds grow over, and monitoring new growth patterns is something many people pay no attention to at all. Kids can learn a great deal with simple observation, and even more by charting results. Install a program or an app: Technology, security and practical applications collide when [supervised] children are allowed to install their own software on a PC, table or smart phone. Play Minecraft: The benefits of playing Minecraft are now amply documented. Let kids play and watch what happens! Visit a grandparent: One of the most valuable experiences in life is to spending time with a grandparent or great-grandparent. If no grands are within commuting distance, children can visit senior centers to spend time with citizens who have much to share about the past, life experiences, general wisdom, history and more. Shredding documents: For children old enough to be trusted with this equipment, this activity is both fun and raises discussions about the need to shred certain documents, and the possible consequences of not doing so. Visit a plant or factory: Factory tours are excellent ways for kids to see how things are made. Go sight-seeing: Pretend to be a tourist and take in the sights where you live. Benefits to acting like a tourist are many. Take in a concert: Most cities and towns offer a free concert series during the summer, or all year long. Great way to learn about musical genres, different instruments, parts of an orchestra, terminology, vocals and more. Take and score a test: Any test will do. Most kids will need this skill eventually, so it’s a good idea to learn it early and practice periodically. Visit a showroom: It can be very eye-opening to view prices and options of cars, furniture or appliances. Kids will also learn different features, terminology, comparison shopping, and maybe something about how these items are made too. Tie a knot: Most people are never taught, thus are unable to tie a secure knot in anything. Believe it or not, this valuable life skill comes in handy more often than you realize. Translate a passage: Online translators are free and provide a glimpse into learning a new language. Set up an account: With parental supervision, older children should be guided through the process of setting up an online account. Touching upon careful password selection, choosing security questions, establishing a username and selecting appropriate levels or privacy and security should not be left up to teenage experimentation. The time to teach children is when they’re still at home, and may be guided by the parents, so that they do not make lasting, potentially tragic errors later on. Protect and store valuables: Another life skill that many children should be taught, rather than left up to chance. Grab some number cubes (dice): It’s amazing what people come up with when handed a pair of number cubes. Games and learning collide when children and adults alike put their heads together to make up crazy games and lessons with these simple learning tools. Build (or try to build) a house of cards: This seemingly simple activity overflows with extensions into mathematics (geometry), physics and engineering. Do the Sunday crossword, word jumbles or Sudoku together: Or select easier ones the kiddies can do alone, or with minor help from you. Versions available online, too. Go to a trade show: Check the local listings for conventions and trade shows coming to your area. You new know what you’ll learn at home shows, tech demos, gaming tournaments and more. Cathedral/church tours: Visiting places of worship can be about finding a church community. But, depending on where you live, it can also be about sampling different philosophies, learning about world religions, viewing different styles of architecture, learning the history of an area, and more. Gourmet food trucks: These traveling restaurants on wheels are fun to locate, and even more fun to try. Introducing kids to new foods they might not be able to sample anywhere else is all part of the adventure! “As Seen on TV” products: Depending on your point of view, checking out these sometimes-ingenious, often-silly items can be a great way to talk to kids about inventing new products, successful advertising, unnecessary spending, or whatever else you like. Such products can often be found in drug store chains and shopping malls. Make a word collage: Using Wordle or a similar program/app, creating word collages encourages kids to think about word relationships and word choices while pulling together concepts onto a word board. Design sensibilities come into play when kids are forced to think about color schemes, word shapes and make other design choices. When framed, these make great wall hangings, too. Open a tube of crazy glue: Bonding agents offer fascinating opportunities for learning. Adult supervision required. Dig a hole: Remembering digging for “clay” as a child? If not, be sure to join your kids on this easy learning adventure. If you find any, be sure to craft a small vessel and leave it in the sun to dry for several days. Extensions include learning about nature, native peoples, ancient artifacts, or whatever else you like. Cut paper dolls: These don’t have to be dolls, but paper folding and cutting repeated shapes offers lots of learning. Coordination exercises, too. Paper chains offer fun and learning, too! Create a book shelf or home library: Asking children to pull books out of closets and off the shelves to put them in order is one of the best ways to spend a Sunday afternoon, in my opinion. Just watch as they learn and read, and also discuss book classification, writing genres, subject areas, and practical things like book sizes and placement, too. Have an animal parade: When my children were little, some of the most fun we ever had was pulling out all the plush toys and having an animal parade. I’ll leave the learning up to you, but (hint!) it involves counting, patterns and shapes, classification, measuring and more! Stage a production: A play, a fashion show, a variety show, a musical recital, sing-a-long, or anything else they can think up. Ready, set, go! Hair styles: Hair styles have come a long way, particularly in the areas of up-styles and braiding. Looking up photos and duplicating them at home can be great practice for young people, and will result in many new ways to wear hair, too. Pinterest ideas: Shop Pinterest for ideas you can do with things you already have on hand. Need I say more? Make an obstacle course: Whether on the driveway or in the backyard, kids learn by designing the course, but also about their own physical capabilities and fitness, too. Make (and bury) a time capsule: This fun activity can take weeks to pull off, involving many different areas of learning in the process. “How does it work?” activities: Looking up a product or process, and discovering how it works, is an excellent way for kids to learn something new. Try television programs and online videos for starters, then search for web sites to explain anything they might still want to know. Keep a journal: Many children enjoy keeping a journal of writing, sketches, ideas and more. Set out to discover “The Best” of something: Whether searching for best cheeseburger in town or the best way to tie a shoe lace, kids will take this activity in many different directions, each packed with new and different ideas they never knew before! Establish a scoring system (thumbs up or down, or some kind of ranking) if you like, too! Climb a tree: Think it’s simple? Think again! And if they’ve got a strong foot-hold or a safe place to rest, send up supplies like rope, a camera or a sketch pad, too. Create a fitness training program: This is a great way for kids to plan activities and benefit from greater levels of fitness, too. Families can get involved in all getting healthy together. Mix something together: Paints, melted bits of crayons, drops of essential oils or perfumes, glitters, liquid soaps, oils and vinegars, milk and food coloring, or anything else on hand. Predict outcomes. Invent new colors. Name scents. Live science in a fun way. Polish something: It seems nobody polishes shoes any more, but why not let kids give it a try? Brighten up a sink or bathroom tiles, too. Polish silver or copper. What else needs a good scrub and a polish in your home? Creating polishing compounds can be fun and rewarding, too. Learn chemistry by studying reactions (think: vinegar and lemons). Learn about abrasiveness by trying different salts and powders. Start a blog: Older teens in particular will enjoy this activity, plus having a place to post photos, writings and more. Whether free or hosted, this activity teaches web site/blog creation and give families the opportunity to discuss privacy and security issues, too. Create a vision board (or idea board): Visual thinkers and dreamers of all kinds learn about pulling concepts, thoughts, designs and visions together by creating idea boards from magazine photos, paint chips, fabric swatches, famous quotations, and anything else that contributes to a thought collage. Train a pet: Kids learn about animal psychology and physiology while having fun teaching commands, tricks and new pet behaviors. Watch the “tube”: Lots of quality programs air during the day. Select your favorites and let the learning begin! Discover lists: The internet is full of lists of best places to live, best colleges to attend, best educational web sites, best books for kids, most kid-friendly destinations, and more. Find some lists and explore these trails of learning. Final destinations not always required, as the learning occurs all the way. Make art supplies: Kids enjoy DIY recipes for paints, chalks, doughs and more. Hit on chemical properties, cooking skills, measurement math, and other areas in the process. Talk about saving money, too. Perform magic tricks: Magic tricks can be fun, but also a way to learn about the brain. Learn some tricks first, then study explanations for why these tricks (and the reactions of those who witness them) are so successful. Play with small toys: Pocket toys (like a yoyo, a top, a Slinky, pick-up stix, a gyroscope, a kaleidoscope or jacks) offer fun and learning about physics,engineering, cooperation, coordination, game-playing rules, and more (without anybody even knowing it). Read food labels: Extensions include wellness, nutrition, disease, standards, advertising gimmicks, measurement, grocery math, chemistry and more. Play a keyboard game: Online games require kids to learn keystrokes or click sequences to move and score. Sort laundry: For some kids, doing laundry signals fun. When turned into a game, many young children can be taught color matching, size matching, coordinating clothing items, counting, and lots more, just from helping in the laundry room. Create/visit a maze: If there is a corn maze or hay maze near you, why not visit? If not, kids can create their own mazes out of cards, blocks, dominoes and more. Drawing mazes on paper can be fun, too. Don’t forget the learning that comes along with mapping out solutions, too. Assign nap time or time out: Possibly the best learning of all comes from leaving children entirely on their own (supervised, of course). Children left alone, kids who should be napping, and children placed in a quiet zone (or time out), find some of the most creative ways to pass the time. Be a fly on the wall and just watch what your kids come up with — without any help from you at all. Guaranteed learning, and different almost every time! …kids who should be napping…find some of the most creative ways to pass the time. I hope I have helped you recognize the tremendous learning that comes from even the simplest of activities, and inspired you to try some new things this year. Feel free to share some of your easy and effortless learning tips here, too! And be sure to leave a COMMENT about how you plan to spend the next 100 days! An alphabetical list of resources to help teach homeschool mathematics. Looking for a BIG list for English? Find it HERE! Looking for a BIG list for Science? Coming SOON! Did I miss one? Leave a COMMENT! Broken link? Thank you for letting me know! Want these delivered to your Inbox? Subscribe here. 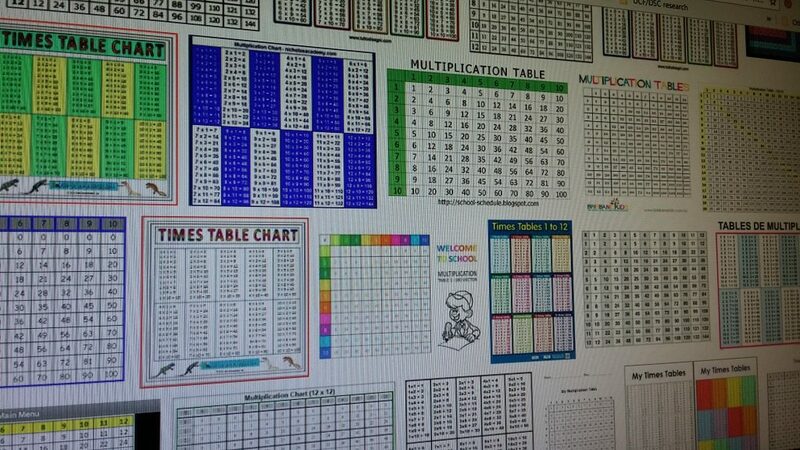 Many of our parents and grandparents remember endlessly reciting math facts. Today, rote memorization is rather frowned upon — that is, unless students first understand the principles underlying the facts. No matter your stance on this debate, few people question the need for kids to remember math facts — especially “Times Tables”. There is just no substitute for being able to retrieve multiplications facts quickly, since knowing them makes other math problems so much easier (and quicker) to solve. Lots of kids pick up math facts quickly — even on their own. Others need help and lots of practice before the facts are cemented into their heads. Let’s not forget, tools for learning facts can easily be made from scratch. Creating flash cards, tables, and charts is very easy to do, and can be done [free] using supplies most people already have on hand. Designing posters to hang on the wall is really simple, too. Making board games to teach facts is fun, too. Kids love to design their own games, learning all the while without even knowing it!